Young Justice #2 review: Path of Wonder – AiPT! Gemworld! Jinny Hex! Robin on a unicorn! Wonder Comics’ vision is self-explanatory. One grasps what it is immediately upon looking at any image that promotes the new imprint. Young heroes of the DC Universe finding their place in the world with a sense of wonder in their eyes and a grin on their face. Superhero comics are built on that wonder, that impressive awe we all had when we first encountered the genre and its icons. It’s the kind of thing that gets harder to replicate as time goes on, but when you’re dealing with young characters who’re living these heightened lives in the heightened realm of the DC Universe, it’s a lot easier to bring it out. Their lens and perspective will not be that of an assured adult, it’s something different. Their struggles are more varied, they’re experiencing so much beyond just the superhero persona they inhabit that it’s ripe for digging into story. And that’s what Brian Michael Bendis has excelled with over the years, writing the defining Ultimate Spider-Man with Peter Parker and later Miles Morales. The latter has now even made the leap to the movie screen and represents the great power of representation and diversity in fiction. With a track record like that, it just makes sense that when moved to DC, he’s let loose on the teen superhero corner of the universe. It’s one of his niches and he’s found great success with it. And thus we have Young Justice, the flagship title of Wonder Comics. The debut issue was a fervent and kinetic mission statement fueled by sheer euphoric power. Bart Allen was very much the heart and soul of the issue, espousing the core ethos of not only the book but the line as a whole. The conclusion to the first issue saw the entire team of young heroes dropped into Gemworld and #2 picks up right from that, as the characters reel from their trip inside and try to journey through this unfamiliar realm. It’s a fairly decompressed story built around touching character moments with lush artwork and colors by Gleason and Sanchez, which is what one expects. However, this issue introduces a new element to the mixture. Each issue from here on out, in this arc dubbed ‘Seven Crises’ (a fascinating choice), will feature an individual flashback segment that chronicles the past of the various members in the team. And each segment has a special guest artist brought in to serve the story being told. A lot of these characters have been away for a while and their backstories and histories are murky, to say the least, and thus the choice is a smart one. This issue’s segment focuses on Wonder Girl, Cassie Sandsmark, as we learn where she’s been emotionally and what her driving conflicts and goals are at the moment. Guest artist Emmanuela Lupacchino joins the book for this special story, bringing great flair and energy that fits perfectly with what’s been established for the book while also being its own unique entity. It’s a decision that really pays off, as Sanchez’s colors go remarkably well with Lupacchino’s artwork, much like with Gleason’s and he helps unite the entire book with a lush, rich aesthetic. Every color pops off the page as Sanchez manages to balance the darker sequences without undercutting the bombastic and bright moments. There’s a lovely sheen and texture to the entire book, brought out through the color which makes for some standout storytelling. It’s distinct enough that you can look at a page and immediately know it’s Sanchez on colors. Cassie’s story sees her meeting Zeus (though it’s a flashback taking place before his death in Wonder Woman) who has come to meet her on Earth for the very first time. It’s an unusual situation, as Zeus tries to display warmth and form a bond with Cassie, only eliciting suspicion from her. He then reveals that her role is to be the heir to the gods, ultimately becoming one of the pantheon and he hands her a special necklace that’s meant to be be hers. It’s absolute power and he gives it to her, telling what she needs to be. But Cassie is shocked, asking why she’s being given such power and what she’s ever even done to earn it. Turning down Zeus, she tells him he can keep the power and that she’s done listening to men like him telling her what she needs to be and when. She will follow her own path and be her own person, in her own time and if her destiny is what Zeus tells her it is, it’ll come to pass eventually. The decision irks Zeus and he vanishes into the wind, while Cassie grins with pride. This is a key moment and it continues to build out the vision outlined for Wonder Comics. These are kids with their own wishes, needs and goals, they are not to be told who or what they are. They hope to find that out themselves, in their own way, without an adult handing that supposedly absolute truth down to them. It’s why, if you’ll notice, all the antagonists are adults, with adult mindsets, steeped in old tradition and ideology. And it’s why the chief antagonist of the story is Dark Lord Opal of Gemworld, a realm of old tradition that binds youth and serves the old in power. These aren’t arbitrary decisions, the setting and setup serve the core content and thematics of the book. It’s not merely window dressing, as some may easily assume. It’s why Amethyst, the outsider and upstart youth of Gemworld, has to be there. It’s why she has a purpose on the team. Meanwhile other heroes, such as Jinny Hex, are much more lost. Wrestling with similar struggles as the others, as all young people do, she finds herself uncertain, anxious and lost, quite literally, in a world she does not know. She simply has no idea and she’s just winging everything while figuring stuff out bit by bit. And that’s very much her story, as she’s someone who chanced upon a box full of superhero memorabilia, which is the legacy of her ancestor Jonah and is trying to figure things out. There’s definitely a lot of Greatest American Hero in her and her simple reactions to everything, drawn by Gleason who excels at expression, body language and character work, are a delight to witness. Josh Reed’s lettering is also key here, as he brings a real charged personality to the book. He bridges Bendis’s text and Gleason and Lupacchino’s art, landing every bit of dialogue with great flair and readability while also accentuating everything great about the artwork on the page. Collecting themselves after their crash, most of our heroes soon begin to journey across Gemworld. 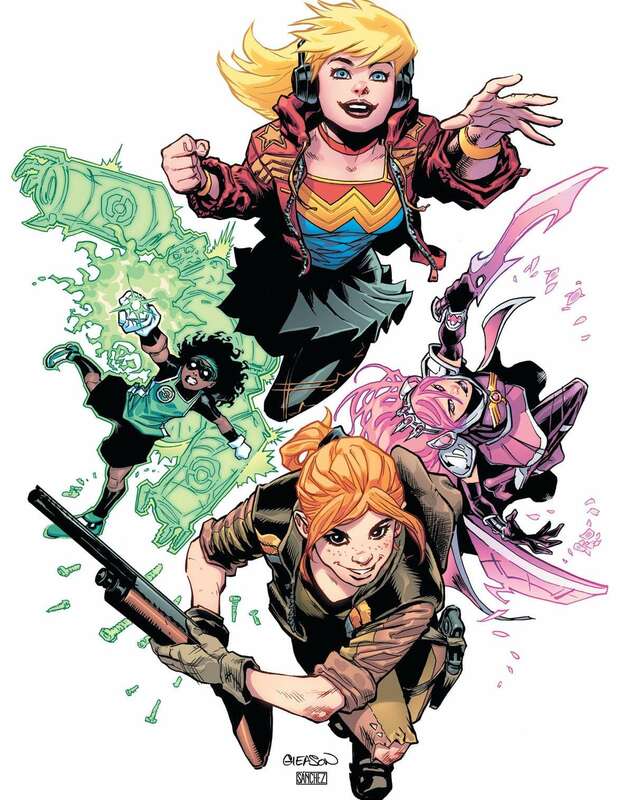 With Robin and Amethyst on a unicorn and Wonder Girl, Teen Lantern and Jinny Hex in a car, they venture out and end up running into one another. Regrouping and catching up, they make quick introductions and banter, before Dark Lord Opal emerges ominously, concluding this chapter of the Seven Crises saga. Young Justice #2 builds on the exuberant spirit of the book while adding new layers for some of its core characters. Cassie Sandsmark gets a touching spotlight in here that cuts to the heart of not only what this book is, but what the line it represents is as well. Bendis, Gleason, Lupacchino and Reed present another joyous installment in the rebirth of the ultimate teen hero team of DC Comics. If you’re a fan of legacy in the DC Universe, this is absolutely the title to be reading. Gemworld, Jinny Hex and Robin on a unicorn, what more could you ask for? Young Justice continues to be exuberant and earnest, delivering on Wonder Comics' meaningful mission statement. This is a joy to read. Bendis' voice for the entire cast. It's both fun and believable, capturing the essence of youth. The book is far more decompressed than one may expect and it does move slowly. It's purposeful but definitely something that works better when read together at once.